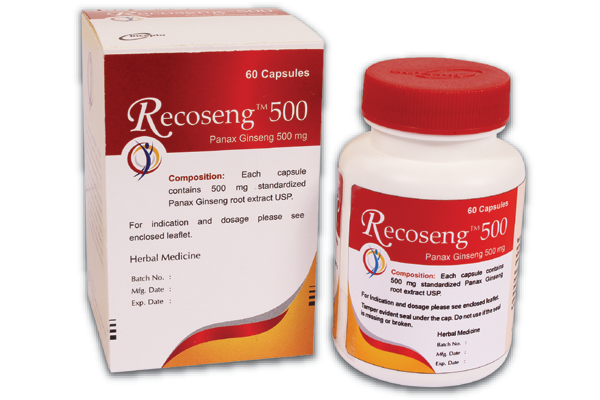 Each capsule contains 500 mg standardized Panax Ginseng root extract USP. Ginseng is an ancient herb that is claimed to help the body to prevent and fight against diseases, provides energy to people who are stressed or fatigued. It is sometimes used during recovery from illness. For more than 2,000 years, the roots of this slow-growing plant have been used as medicine. Panax ginseng is used for improving thinking, concentration, memory and work efficiency, physical stamina and athletic endurance. Panax ginseng is often referred to as a general well-being medication, because it affects many different systems of the body. Panax ginseng contains many active substances. The substancethought to be most important is called ginsenosides or panaxosides. impotence (erectile dysfunction) and improve menopausal symptoms such as fatigue,insomnia and depression." diarrhea, itching, rash and dizziness." Ginseng should be used cautiously in patients with diabetes as it may reduce the blood glucose level. Caution should also be taken during use of Ginseng in patients with bleeding/clotting problems.